"A work of art takes as long to make as it takes." That's the nature of art. Lowcountry construction is more comparable to a manufacturing process and can take anything from 6 to 12 months to complete a residential contract. But what if we took a page from other industries and re-engineered the process? Could we build a great home, on-site without compromising quality in only 8 weeks? Is that impossible? Perhaps, but that is the challenge we set for ourselves, and we put $500,000 into making it happen with two homes on Folly Beach, funded by South Atlantic Bank. This is the story of how we came to set that goal and then went about making it happen. Before we resort to self-congratulation, this approach is not appropriate for all Charleston homes or all situations - what you lose in geometric flexibility, you gain in speed and partially, in the final cost. SO WHAT WERE OUR TARGETS AND RESTRICTIONS? We targeted shaving 65% off our build time and 20% off our build costs. Lofty goals to be sure, but maximizing a return on investment dollars means being strategic in identifying spending reductions along the way. One thing is sure, repeating the same mistake twice and expecting a different outcome is the definition of insanity, so resorting to the most common construction process used in Charleston, stick-build, is not going to cut it. Even a honed "track build" operation is not going to hit our target. We also had restrictions of "building to code," in a wind zone, on the floodplain, and in a FEMA V Zone (subject to breaking waves). We designed a 1,500 square feet over two floors within a 40-foot height restriction and a maximum build price of $200 per sq. foot including yard and pools. No pressure, right? We also decided to minimize maintenance costs with cementitious siding and trim, reflective shingle roofing with Galvalume metal for feature elements. Vinyl impact-rated windows, good grade internal finishings, granite countertops, 10-foot first-floor ceilings, 9-foot second floor, hardwood decking, stainless structural accessories. High SEAR rated HVAC was fitted throughout to maximize efficiency and minimize run costs as was high-performance insulation and air sealing. Still no pressure? Our challenge: To build two small, energy efficient, three-bedroom homes, at a fixed price, to a good standard, to code with a beautiful rear deck and pool, in record time on the beach just 15 minutes from downtown Charleston. The homes will be short-term vacation rentals in the summer and monthly rentals in the winter so subject to quite heavy use. 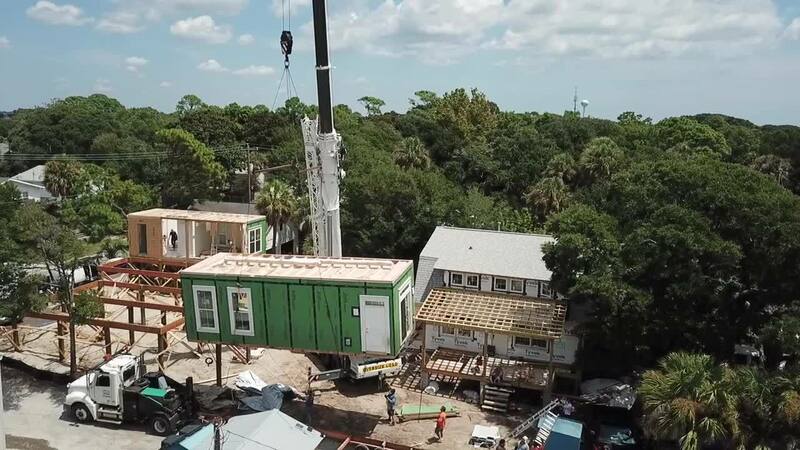 We looked at container homes, Structural Insulated Panel (SIP) homes, concrete homes, steel homes, indeed an array outside of mainstream construction suitable for the lowcountry or on occasion otherwise (Cobb - ever heard of that one?). We eventually settled back on stick build, BUT the build would be off-site, using Appalachian labor in a remote production setting. Our design would play to the strengths and geometric limitations of this method. For example, no hipped roof structures, no windows spanning a floor level, no curves or bump-outs. We specified our own internal finishing standards for kitchens and bathrooms that were installed and tiled before shipping. Where we wanted something unique, we elected to fit on-site; floors, and siding without joint lines, decks, feature roof elements, external lighting etc. Some 75-80% of the total build process was outsourced to a production environment in a jurisdiction with both lower labor and materials costs and where we were free of weather interruptions and a requirement to organize the process in a fixed sequence with sub-contractors. For example, the roof was built first! We also spent some 3 months understanding the process itself and how best to organize our own teams to support. It is true that design changes at the concept stage are almost free, design changes during production are very costly so we sketched and modeled, sketched and modeled .... until we had what we wanted then we pressed the expensive button marked "GO". So whilst that was all going on we had cleared design review and permitting within the City of Folly Beach. We organized soil survey and setting of the piles, then we wrangled them into position. Did it all go smoothly? Not really. A measuring error led to us being too close to the main power supply for the east side of Folly Beach - that's 24,000 Volts AC three phase. Could we argue they have encroached our boundary? Yes probably. Would we win? Probably not, so the pragmatic solution was to move one house 10 feet backward, take an educated guess at the engineering and let the calculations catch up. Our site architect, Allen Kinter, was a trooper in this regard and really worked it. Good teams are only formed in adversity, and we have a really great group of subcontractors. We had 8 modules delivered to a site on Folly Beach (AME Church, very friendly Pastor), we hired what seemed like the worlds largest crane (you could see it from the middle of James Island!) and waited for a break in the weather. Setting the units started at 9:00am one day and was completed by 12:00pm the next day. Folly Beach police shut us down at 8:30 pm; we did push our luck past 6:00 on account of impending rain, and they were gracious about it. We started the next day at 7:00am and completed setting by 12:00pm. The roofs and sides were completed in time for the weekend. Week 3: Final bolting between units, soffits completed, siding to the outside of the building, temporary walls removed internally, sheetrock and trim to the inside and underneath the parking area. Week 4: Floors laid internally and polished. Decks fixed externally, rails and stairs. Roof trim added where needed. Tap connections to services, sub-floor, curb cut and parking. Week 6: Completion of power connections, concrete to garage floors, cross bracing of piles. Week 6.5: Pools delivered and garden laid out ready for planting. Week 8: Keys handed to our short-term rental experts, Luxury Simplified Retreats, and the homes are ready for furniture move-in and guest arrival. So here we are with two Folly Beach homes set on their piles, kitchens and bathrooms fitted, internal decoration completed and the outside being completed over the next week or so. Our initial risk has for the most part dissipated, part two will reflect on whether we hit our time and budget targets, so stay tuned! LOOKING TO BUILD IN CHARLESTON SC? This is just one example of how our expert construction team brings a project to life, and the transparency throughout the project. Have a look through our portfolio and start planning your new build in the lowcountry!